Are you obsessed with drones? Do you love flying these mini-aircraft and capturing images of everything around you? Now you can cash in on that hobby. The Federal Aviation Administration (FAA) has started issuing permits for people to use drones for business purposes. Jase Robak used his drone to record a three-alarm fire and other local events, but as a hobbyist, he couldn’t sell his footage, reports Nebraska-based KETV. Now, thanks to his permit from the FAA, he can capture video and photos from his drone and sell them to clients, from real estate agents to insurance companies. Want to make some money flying your drone? Here’s what you need to know. If you intend to make any money from your drone flights, you do. The FAA’s commercial permit covers everything from wedding and real estate photography, to land mapping and surveying, factory inspections, and even security services. If you’re going to use your drone for any of these tasks, you’ll need to get a business permit. You’ll need to petition the FAA for your business permit via a “Section 333 exemption.” You’ll have to describe your drone, and how you maintain and control it, as well as your qualifications and business plan. Outline exactly what you’ll do and where you’ll fly the drone in detail, including altitude, distance and approximate location. See this guide for more details. It typically takes 120 days to get your permit, so be sure to get started soon so you can take advantage of summer’s great flying weather. As of July 2, the FAA has granted 723 of these petitions. Of course, even after you obtain your permit, you must follow a number of rules and regulations governing your drone use. The operator must be in line of sight of the aircraft at all times and only fly during the day in clear weather. 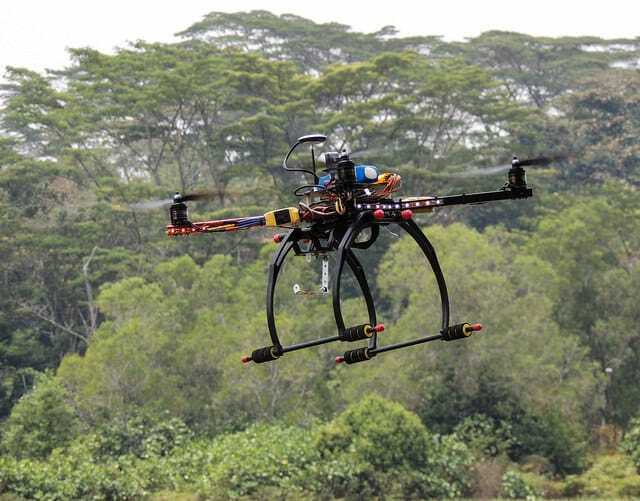 Drones must stay below 400 feet and fly at less than 100 miles per hour. And forget delivery services — you can’t drop any objects from the drone and must stay away from people and populated areas, among other regulations. Map makers, topographers and even archaeologists need aerial surveys to fully evaluate some of their projects. In the past, companies had to shell out for costly helicopter and airline flights to give them the aerial perspective they needed. However, drone operators can provide these same great aerial views with lower overhead costs. Drones can also fly low and slow, which helps them capture better images of a site than a traditional aircraft. Drones can go places reporters can’t, and for this reason, drones now film all sorts of accidents, disasters, conflicts and other incidents in dangerous places. If you can safely fly your drone to report on a story, consider contracting with a news organization to offer footage. However, be cautious and make sure you have permission to fly your drone in that particular situation and location. For example, some drone pilots are causing trouble for wildland firefighters, in some cases causing conflicts with firefighting aircrafts and imperilling firefighters. Real estate agents trying to sell a mansion or estate can include amazing drone footage, along with interior and exterior shots, to intrigue prospective buyers. Resort or hotel marketing teams can show the luxurious pool, the palm trees swaying in the breeze, and the content guests enjoying the amenities. Aerial footage helps capture the essence of a home or resort. Look for clients in these industries who might hire you to provide the visuals they need to market their properties. While GoPro and other action-sports video cameras have mastered the first-person point of view in sports photography, drones can capture the overhead, bigger-picture view. By working with athletic events or competitions, a drone operator can capture great footage of everything from a skier jumping off a cliff, to marathon racers rounding the last bend before the finish line, to footage of out-of-the-way bike races. People pay top dollar for wedding photography and videography. Why not add drone footage to that list? Some couples will be willing to shell out in order to catch the “eye in the sky” perspective of their big day. Catch the bouquet toss from a whole new angle, pan out and show the overhead view of the dance floor, or showcase the venue and happy revelers as the sun sets in the background on a perfect day. You can help happy couples capture those moments forever.